MontessoriReStore, a super sweet Etsy shop, specializes in beautiful Montessori and Waldorf inspired toy bundles that focus on building sensory, language and fine motor coordination, education, and most of all, fun. MontessoriReStore sets are designed to make learning interesting and open-ended. For example, the adorable, rascally squirrel math kit is designed to help encourage counting skills plus adding and subtracting knowledge, using interactive and playful materials. 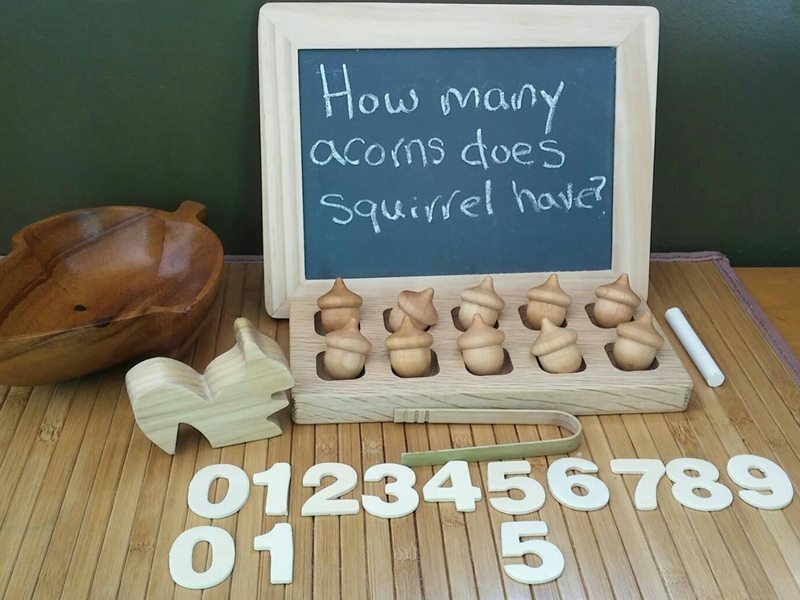 The kit includes: one wooden frame, a cute wooden squirrel, 10 wooden acorns, bamboo tongs, a reusable chalkboard, wooden numbers (with extra 1,5,0), and a wooden bowl or basket. The coolest thing about the kits at MontessoriReStore is how all the various items in each kit can be used in many fun ways as your child grows, making these kits a great deal! RELATED | 6 Eco-Friendly Games and Tools that Make Learning Math Fun! MontessoriReStore, a super sweet Etsy shop, specializes in beautiful Montessori and Waldorf inspired toy bundles that focus on building sensory, language and fine motor coordination, education, and most of all, fun. MontessoriReStore sets are designed to make learning interesting�and open-ended. For example, the adorable, rascally squirrel math kit is designed to help encourage counting skills plus adding and subtracting knowledge, using interactive and playful materials. The kit includes: one wooden frame, a cute wooden squirrel, 10 wooden acorns, bamboo tongs, a reusable chalkboard, wooden numbers (with extra 1,5,0), and a wooden bowl or basket. The coolest thing about the kits at MontessoriReStore is how all the various items in each kit can be used in many fun ways as your child grows, making these kits a great deal!